There’s no shortage of chic accommodation options in Porto, Portugal’s ever growing tourist destination. And the latest to open its doors, is Malmerendas Boutique Lodging. Comprising just five rooms, the property is located just off the busy main street of up-and-coming downtown neighbourhood Mercado do Bolhão. 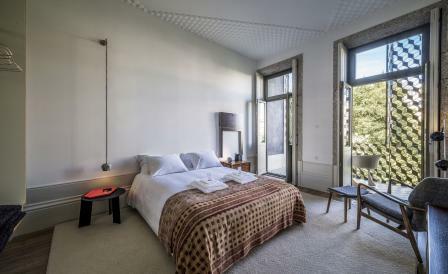 Set up by designer and marketeer Joana Coelho and João Almeida, who live on the ground floor of the tastefully refurbished 20th century townhouse, the property’s rooms are individually decorated to combine traditional Portuguese textiles with sleek Scandinavian-style furnishings. ‘We wanted to rethink the nature of the common boutique hotel,’ explains Coelho. ‘For returning guests, the experience of staying in Malmerendas will always be a different one.’ There is no restaurant, but tasty meals can be rustled up in the in-room kitchenette, using fresh produce from the local 19th-century market, Mercado Bolhao.